In the modern world, we tend to mimic the technology by focusing on our minds and bodies’ performances while neglecting the most important side of us – our souls. Yes, we pray 5 times a day and fast every now and then, but we’re so distracted with life that we often fail to stay connected to the core of these worships and to the One whom we worship. You might feel fired up and motivated to incorporate dhikr into your life after reading one article or 2, but without understanding and internalizing its importance and without the commitment to prioritize it, you will be missing out on what may be the only chance to nourish your soul, staying focused on the bigger picture, practicing gratitude and protecting yourself from evil and harm, all in a daily and consistent form. 3) Free Printable of (وایّاک نستعین) “And You Alone We Ask for Help” – Supplications for morning, evening and protection (select “Dua’ain Awr Azkaar” in category section to see all the free downloads related to various supplications etc.) – [ the book can be bought HERE ]. Our brains have a tendency to resist what is new and only stick to the old and comfortable, so attempting to go from zero dhikr per day to having your tongue rolling non stop with it is a bit of a challenging habit to stick to. Instead, try starting small. For instance, commit to doing your morning and evening adhkar for a week before adding post-prayer adhkaar or random dhikr throughout the day. This again is an important ingredient in building and keeping a habit because it teaches your brain that no matter what you go through, you will stay loyal to your dhikr habit. When you commit to that small amount of dhikr, also commit to never go a day without a minimum of it no matter how tired and busy you get – even if you just recite one ayah before closing your eyes to sleep instead of the whole 5 minutes night dhikr you initially committed to. If you break the chain, your mind may not take your commitment seriously anymore! We spend most of our day on autopilot mode, performing little actions without much thinking because we’ve been doing them for so long that they became a part of us. A great way to start a new habit is tying it to an old one. Pick one habit you do every day and commit to making your Adhkaar while doing it or right after it. For instance, I love reading my morning adhkaar while making my bed or while waiting for the toasts to grill. You can also associate it with a coffee break in the middle of the day or take some time after prayer to sit and do your dhikr. As I mentioned earlier, new is not easy on our minds, so try to make dhikr easy on yourself, and since it is the word of Allah, sooner than later, you will find yourself addicted to it and your tongue won’t find rest unless you use it for dhikr in shaa Allah. But for starters, make dhikr accessible for you to reach out for and read. Perhaps download apps you like, download the adhkaar in an audio form, stick post-it notes or adhkaar stickers on doors and refrigerator etc., set reminders on your phone, keep a copy of Hisn ul Muslim around etc. 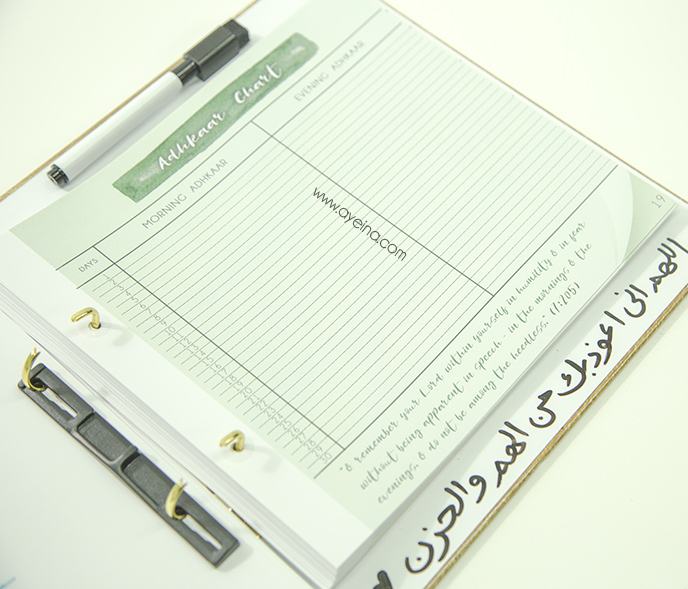 Keeping a journal or a chart to check off whenever you perform a habit is a very effective way to stay motivated. You can write down the adhkaar you want to recite each day and progress towards learning more of them. A month is usually enough in terms of habit building, but if you feel you need to do it more than that to be able to stick to it, then simply reprint the page and punch it in the binder. In my own journey of trying to commit to morning adhkaar, this was one of the most effective ways I used. My cousins and I used our Whatsapp group to keep each other accountable for making our morning and evening adhkaar in a way that each of us reported that she did hers. 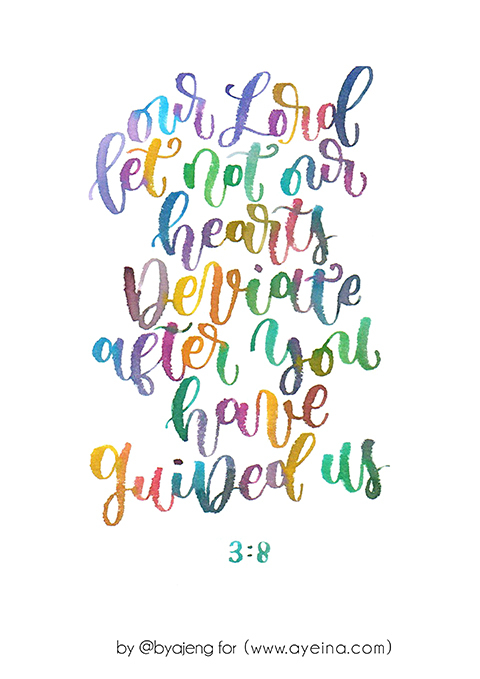 This served both as a reminder and an encouragement to do mine. At the beginning, a lot of us missed our adhkaar while others stuck to it, but it took us less than 2 months before we all stopped needing to report our achievement because it just became a pillar in our day we couldn’t stand firm without! 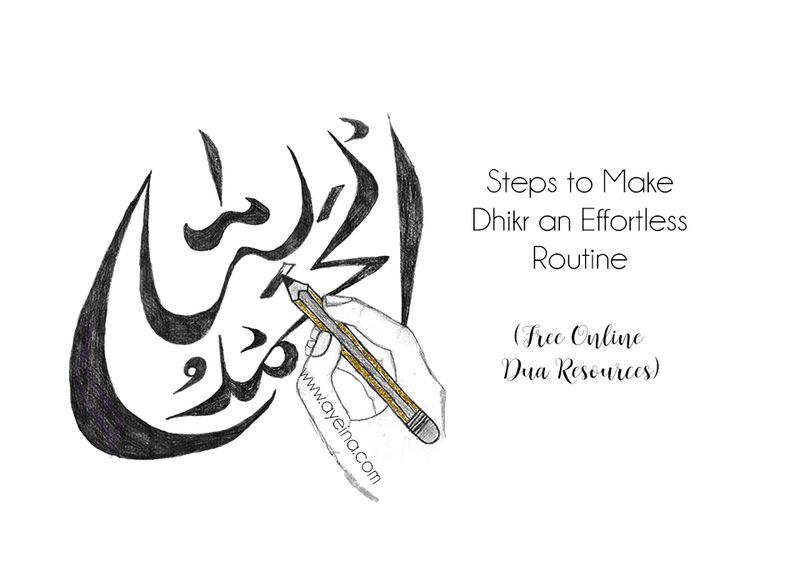 The point of reciting dhikr is to soften the heart as it starts reconnecting us to its Master and finding shelter in Him alone, so it is rather intuitive to ask Him for help and support when committing to making this beautiful worship a part of our lives. So the first type of dhikr we need to do is asking Allah to help us succeed in doing this because at the end of the day our hearts are between His fingers. Author’s Bio: Kawtar Amrani is a 21 years old writer, photographer and content creator behind RandomlyKawtar.com. For 3 years now, she used prose and poetry to shed light on the beauty of Faith, Personal Growth and gaining knowledge. Right now, she’s continuing her creative journey while pursuing a Bachelors of Quran Studies. She’s an advocate for mental health, slow living and experiencing peace of mind through a strong faith, genuine human interactions, a cup of tea and daily walks. Jazakillah khair for sharing. I recently also did a personal tracker for adhkar and Quran recitation to track my progress. Living in a very noisy and distracting environment, I really need these reminders to keep me guided. These are some great tips. When starting any new habit it’s definitely important to start small and stay consistent. Then it will become second nature. Jazak’Allah khayr for sharing such a beneficial post. May Allah swt reward you abundantly!